It always helps if we have one or two visitors from outer space in our audience, and luckily there were several, cleverly disguised as earthling children. 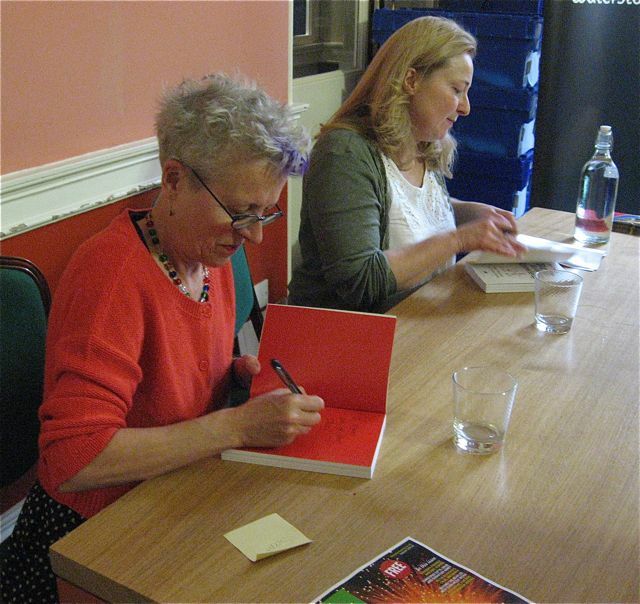 Author Tracey Turner and I were at Bath’s fifth Festival of Children’s Literature to promote The Comic Strip Big Fat Book of Knowledge, our new omnibus edition of the Comic Strip History of the World, the History of Space and the Greatest Greek Myths. Tracey writes the fabulous and witty text for our books, and I draw the pictures. We like to make these events as interactive as possible, so it was great to have a lively audience, especially when we were talking about and drawing UFOs, and getting special visitors to tell us more about their planets. “Blppyleep!” was apparently a greeting from Jupiter which I duly put into a speech bubble. Always handy to know these things. One of the great things about drawing comic strips is how you can change facial expressions very simply but get subtle results. Apparently I pull faces all the time (according to my friends) when I’m drawing characters, but in Bath I had four volunteers on stage to help. 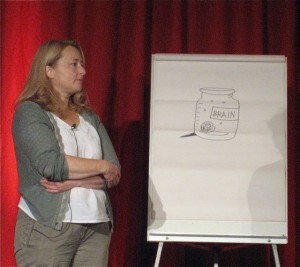 They giggled in an unhelpful manner when I urged them to think of something very sad so I could draw their faces. “Imagine someone has given you a five pound note as a present, the wind blows it away and it falls down a drain,” I suggested to the main giggler. “Money isn’t important to me,” said the seven year old girl. “I don’t like cake, “ said the girl. At these events you never know quite how things are going to go, which we love, and the audience did too. 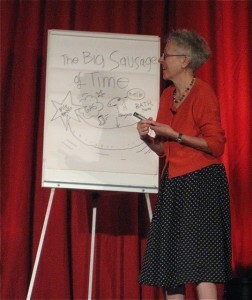 Later, Tracey related the history of the universe in five minutes while I drew a diagram of the Big Sausage of Time, we did some highlights of world history (including the story of an astronomer with a golden nose), got the audience to trick a Greek mythological monster Cyclops with some magical items, then showed them some Dinosaurs (next year’s comic strip book) and had a quiz. Quite a busy hour. But we love a challenge. This entry was posted in Books, Drawings, Events, Festivals and tagged Bath Festival of Children's Literature, Cyclops, drawing demonstration, drawings, quiz, Sally Kindberg, The Comic Strip Big Fat book of Knowledge, The Comic Strip Book of Dinosaurs, the Comic Strip Greatest greek Myths, Tracey Turner, UFOs. Bookmark the permalink.